The enthusiastic response we get each time a new Laurel Burch creation arrives at the store always validates the appeal of this iconic artist! Instantly recognizable by her whimsical creatures, Laurel Burch equestrian gift items are favorites with both the customers and staff at Mary’s Tack and Feed. 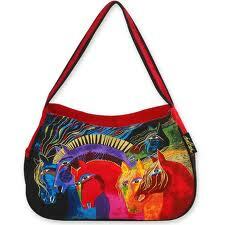 Wild Horses of Fire is one of the newer additions to the Laurel Burch gallery of equine totes & scarves. The impressive stature & greatness of the horse, depicted in bold colors with flowing manes and amazing forelocks, is sure to impress the new customer and the avid collector alike. Everyone loves the jewel toned overnight travel bag for quick trips and it’s perfect for a horse show with its set of inside & outside pockets and water-resistant interior. For Wild Stallions, Ms. Burch must have imagined a band of bachelor stallions, each waiting for the opportunity to break out on his own after capturing the fancy of a mare! This scoop tote makes a great shopping bag as the “scoop” fits comfortably under your arm, freeing your hands to hunt for the key-buy of the day. And you simply have to take a look at the new Heart Embracing Horses, definitely Marys’ employees’ favorite design . It must be the time of year because the earthy browns & rust with a touch of olive green & plum blends in beautifully with the new autumn leaves alongside our bridle paths. Embellished on front with a twist of gold cord, pyramid studs and beads, this is a Laurel Burch bag to put on your personal wish list! Laurel Burch fans are devoted & passionate. Several years ago, while growing our new marystack.com, we proudly placed Rainbow Horses in the gift pages and quickly realized how popular her designs are- almost immediately a new customer found us and commented on the beauty of the new Laurel Burch bag! 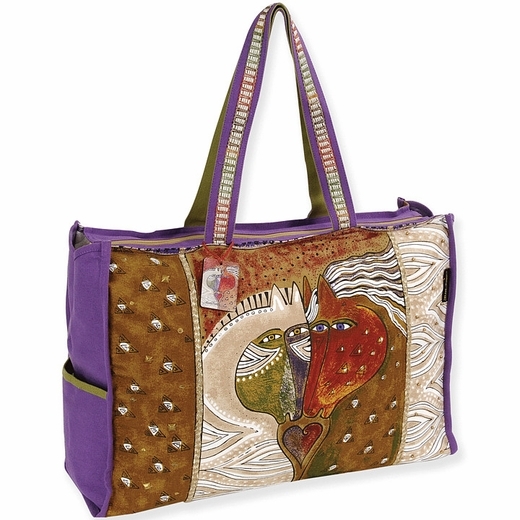 Mary’s admires her as artist and designer and proudly stocks Laurel Burch designs. Mary’s Tack & Feed proudly features Laurel Burch items, including a line of note cards, scarves, luggage tags and more. Whether you’re new to her work or have been enjoying her collection for years, you’ll love the selection at Mary’s! Questions or comments? Need some gift-picking tips? No matter what it is, Mary’s is ready to help you out. Our savvy buyers love doling out advice on their very favorite topics, so leave us a note in the comments or give us a call at 1.800.551.6279. We can’t wait to hear from you!